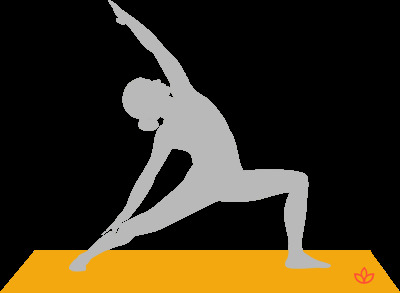 Definition - What does Shanti Virabhadrasana mean? Beginning in Virabhadrasana B, flip the front hand so the palm faces up, then raise the arm to the sky arching the torso toward the back leg. Lower the back arm so the hand rests on the leg. The drishti is toward the upraised hand. In English, shanti virabhadrasana is called peaceful warrior pose. In addition to its physical benefits, including a strong side stretch, shanti Virabhadrasana opens the heart center, calms the mind, improves focus and concentration, and boosts self-esteem. The pose also is believed to activate three of the chakra energy centers: svadhisthana, manipura and anahata. Svadhisthana is associated with joy, pleasure and intimacy. Manipura is the center of personal and transformative power, self-esteem and self-motivation. Anahata is located at the heart center and promotes love, forgiveness, selflessness, compassion and empathy.